Rashidi Zonouz, P., Masoumi, M., Niaei, A., Tarjomannejad, A. (2018). Experimental and Kinetic Study of CO Oxidation Over LaFe1-xCuxO3 (x=0, 0.2, 0.4, 0.6) Perovskite-Type Oxides. Iranian Journal of Chemical Engineering(IJChE), 15(2), 91-102. P. Rashidi Zonouz; M.E. Masoumi; A. Niaei; A. Tarjomannejad. "Experimental and Kinetic Study of CO Oxidation Over LaFe1-xCuxO3 (x=0, 0.2, 0.4, 0.6) Perovskite-Type Oxides". 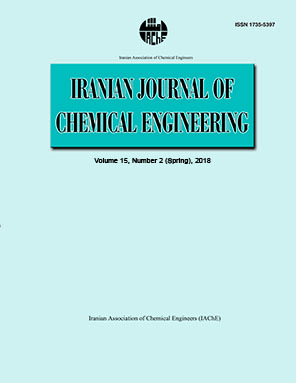 Iranian Journal of Chemical Engineering(IJChE), 15, 2, 2018, 91-102. Rashidi Zonouz, P., Masoumi, M., Niaei, A., Tarjomannejad, A. (2018). 'Experimental and Kinetic Study of CO Oxidation Over LaFe1-xCuxO3 (x=0, 0.2, 0.4, 0.6) Perovskite-Type Oxides', Iranian Journal of Chemical Engineering(IJChE), 15(2), pp. 91-102. Rashidi Zonouz, P., Masoumi, M., Niaei, A., Tarjomannejad, A. Experimental and Kinetic Study of CO Oxidation Over LaFe1-xCuxO3 (x=0, 0.2, 0.4, 0.6) Perovskite-Type Oxides. Iranian Journal of Chemical Engineering(IJChE), 2018; 15(2): 91-102. In this paper, catalytic oxidation of CO over the LaFe1-xCuxO3 (x= 0, 0.2, 0.4, 0.6) perovskite-type oxides was investigated. The catalysts were synthesized by sol-gel method and characterized by XRD, BET, FT-IR, H2-TPR and SEM methods. The catalytic activity of catalysts was tested in catalytic oxidation of CO. XRD patterns confirmed the synthesized perovskites to be single-phase perovskite-type oxides. The synthesized perovskite catalysts show high activity in the range of reaction temperature (50 - 300 ºC). The substitution of Cu in B-site of the perovskite catalysts enhanced their catalytic activity for CO oxidation. Among different synthesized perovskite catalysts, LaFe0.6Cu0.4O3 has the highest activity: nearly complete elimination of CO was achieved at 275 ºC with this catalyst. Kinetic studies for CO oxidation were performed based on power law and Mars-van Krevelen mechanisms. According to kinetic calculations, the most probable mechanism is the MKV-D (dissociative adsorption of oxygen) which can predict the experimental data with correlation coefficient of R2 > 0.995. Tarjomannejad, A., Niaei, A., Farzi, A., Salari, D. and Zonouz, P. R., “Catalytic oxidation of CO over LaMn1-xBxO3 (B= Cu, Fe) Perovskite-type oxides”, Catalysis Letters, 148, 1544 (2016). Ladas, S., Poppa, H. and Boudart, M., “The adsorption and catalytic oxidation of carbon monoxide on evaporated palladium particles”, Surface Science, 102, 151 (1981). Tang, X., Hao, J. and Li, J., “Complete oxidation of methane on Co3O4-SnO2 catalysts”, Frontiers of Environmental Science & Engineering in China, 3, 265 (2009). Shelef, M. and Graham, G., “Why rhodium in automotive three-way catalysts?”, Catalysis Reviews, 36, 433 (1994). Armor, J. N., “Environmental catalysis”, Applied Catalysis B: Environmental, 1, 221 (1992). Taylor, K. C., “Nitric oxide catalysis in automotive exhaust systems”, Catalysis Reviews-Science and Engineering, 35, 457 (1993). Hungría, A., Browning, N., Erni, R., Fernández-García, M., Conesa, J., Pérez-Omil, J. and Martínez-Arias, A., “The effect of Ni in Pd–Ni/(Ce, Zr) Ox/Al2O3 catalysts used for stoichiometric CO and NO elimination. Part 1: Nanoscopic characterization of the catalysts”, Journal of Catalysis, 235, 251 (2005). Zhu, J., Zhao, Z., Xiao, D., Li, J., Yang, X. and Wu, Y., “Study of La2−xSrxCuO4 (x= 0.0, 0.5, 1.0) catalysts for NO + CO reaction from the measurements of O2-TPD, H2-TPR and cyclic voltammetry”, Journal of Molecular Catalysis, A: Chemical, 238, 35 (2005). Viswanathan, B., “CO oxidation and NO reduction on perovskite oxides”, Catalysis Reviews, 34, 337 (1992). Tou, A., Einaga, H. and Teraoka, Y., “Effect of co-deposition of LaFeO3 on the catalytic properties of Pd on Al2O3 support for CO–O2 and NO–CO reactions”, Reaction Kinetics, Mechanisms and Catalysis, 114, 409 (2015). Tanaka, H. and Misono, M., “Advances in designing perovskite catalysts”, Current Opinion in Solid State and Materials Science, 5, 381 (2001). Keav, S., Matam, S. K., Ferri, D. and Weidenkaff, A., “Structured Perovskite-based catalysts and their application as three-way catalytic converters: A review”, Catalysts, 4, 226 (2014). Izadkhah, B., Niaei, A., Salari, D., Hosseinpoor, S., Hosseini, S. A. and Tarjomannejad, A., “Catalytic removal of CO and NOx using sol-gel synthesized LaB0.5Co0.5O3 (B= Cr, Mn and Cu) and LaMnxCo1-xO3 nano-perovskites”, Korean Journal of Chemical Engineering, 33, 1192 (2016). Buciuman, F.-C., Joubert, E., Menezo, J.-C. and Barbier, J., “Catalytic properties of La0.8A0.2MnO3 (A= Sr, Ba, K, Cs) and LaMn0.8B0.2O3 (B= Ni, Zn, Cu) perovskites: 2. Reduction of nitrogen oxides in the presence of oxygen”, Applied Catalysis B: Environmental, 35, 149 (2001). Wu, X., Xu, L. and Weng, D., “The NO selective reduction on the La1−xSrx MnO3 catalysts”, Catalysis Today, 90, 199 (2004). Zonouz, P. R., Niaei, A. and Tarjomannejad, A., “Modeling and optimization of toluene oxidation over perovskite-type nanocatalysts using a hybrid artificial neural network-genetic algorithm method”, Journal of the Taiwan Institute of Chemical Engineers, 65, 276 (2016). Yan, X., Huang, Q., Li, B., Xu, X., Chen, Y., Zhu, S. and Shen, S., “Catalytic performance of LaCo0.5M0.5O3 (M= Mn, Cr, Fe, Ni, Cu) perovskite-type oxides and LaCo0.5Mn0.5O3 supported on cordierite for CO oxidation”, Journal of Industrial and Engineering Chemistry, 19, 561 (2013). Tien-Thao, N., Alamdari, H. and Kaliaguine, S., “Characterization and reactivity of nanoscale La (Co, Cu) O3 perovskite catalyst precursors for CO hydrogenation”, Journal of Solid State Chemistry, 181, 2006 (2008). Zonouz, P. R., Niaei, A. and Tarjomannejad, A., “Kinetic modeling of CO oxidation over La1-x AxMn0.6 Cu0.4O3 (A= Sr and Ce) nano perovskite-type mixed oxides”, International Journal of Environmental Science and Technology, 13, 1665 (2016). Gao, B., Deng, J., Liu, Y., Zhao, Z., Li, X., Wang, Y. and Dai, H., “Mesoporous LaFeO3 catalysts for the oxidation of toluene and carbon monoxide”, Chinese Journal of Catalysis, 34, 2223 (2013). Zheng, S., Hua, Q., Gu, W. and Liu, B., “Catalytic oxidation of CO on LaMn1−xFexO3 perovskites solid solution”, Journal of Molecular Catalysis, A: Chemical, 391, 7 (2014). Abdolrahmani, M., Parvari, M. and Habibpoor, M., “Effect of copper substitution and preparation methods on LaMnO3±δ structure and catalysis of methane combustion and CO oxidation”, Chinese Journal of Catalysis, 31, 394 (2010). Megha, U., Shijina, K. and Varghese, G., “Nanosized LaCo0.6Fe0.4O3 perovskites synthesized by citrate sol gel auto combustion method”, Processing and Application of Ceramics, 8, 87 (2014). Tarjomannejad, A., Farzi, A., Gómez, M. J. I., Niaei, A., Salari, D. and Albaladejo-Fuentes, V., “Catalytic reduction of NO by CO over LaMn1− xFexO3 and La0.8A0.2Mn0.3Fe0.7O3 (A= Sr, Cs, Ba, Ce) Perovskite catalysts”, Catalysis Letters, 146, 2330 (2016). Tarjomannejad, A., Farzi, A., Niaei, A. and Salari, D., “An experimental and kinetic study of toluene oxidation over LaMn1−xBxO3 and La0.8A0.2Mn0.3B0.7O3 (A= Sr, Ce and B= Cu, Fe) nano-perovskite catalysts”, Korean Journal of Chemical Engineering, 33, 2628 (2016). Abdolrahmani, M., Parvari, M. and Habibpoor, M., “Effect of copper substitution and preparation methods on the LaMnO3±δ structure and catalysis of methane combustion and CO oxidation”, Chinese Journal of Catalysis, 31, 394 (2010). Meiqing, S., Zhen, Z., Jiahao, C., Yugeng, S., Jun, W. and Xinquan, W., “Effects of calcium substitute in LaMnO3 perovskites for NO catalytic oxidation”, Journal of Rare Earths, 31, 119 (2013). Yu, Z., Gao, L., Yuan, S. and Wu, Y., “Solid defect structure and catalytic activity of perovskite-type catalysts La1-xSrNiO3-[small lambda] and La1-1.333ThNiO3-[small lambda]”, Journal of the Chemical Society, Faraday Transactions, 88, 3245 (1992). Jaenicke, S., Chuah, G. and Lee, J., “Catalytic CO oxidation over manganese-containing perovskites”, In Fourth Symposium on Our Environment, Springer, 131 (1991). Femina, P. and Sanjay, P., “LaCoO3 perovskite catalysts for the environmental application of Auto motive CO oxidation”, Research Journal of Recent Sciences, 1, 178 (2012). Vannice, M. A., “An analysis of the Mars–van Krevelen rate expression”, Catalysis Today, 123, 18 (2007). Doornkamp, C. and Ponec, V., “The universal character of the Mars and Van Krevelen mechanism”, Journal of Molecular Catalysis, A: Chemical, 162, 19 (2000). Tarjomannejad, A., “Prediction of the liquid vapor pressure using the artificial neural network-group contribution method”, Iran. J. Chem. Chem. Eng., 34, 97 (2015). Farzi, A. and Tarjomannejad, A., “Prediction of phase equilibria in binary systems containing acetone using artificial neural network”, International Journal of Scientific & Engineering Research, 9, 358 (2015). Chan, K., Ma, J., Jaenicke, S., Chuah, G. and Lee, J., “Catalytic carbon monoxide oxidation over strontium, cerium and copper-substituted lanthanum manganates and cobaltates”, Applied Catalysis, A: General, 107, 201 (1994). Wang, K. and Zhong, P., “A kinetic study of CO oxidation over the perovskite-like oxide LaSrNiO4”, Journal of the Serbian Chemical Society, 75, 249 (2010).